Accepta Bromgard 2305 is a high-performance, multi-purpose cooling water treatment based on an alkaline blend of corrosion inhibitor, threshold deposit control agent, sludge conditioner and bromine pre-cursor. 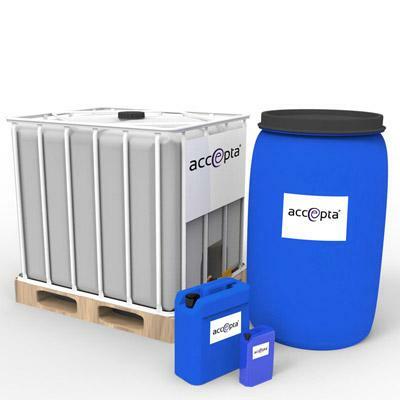 Accepta 2305 is scientifically formulated for the treatment and protection of open evaporative cooling systems. Accepta Bromgard 2305 is a highly efficient water treatment formulation which gives superior protection to multi-metal systems without the requirement of additional specific corrosion inhibitors. When Accepta Bromgard 2305 is used in conjunction with Accepta Activator 120 the correct level of ‘bromine’ is released to provide essential control of microbiological growth in the cooling system. Accepta Bromgard 2305 offers an excellent environmental profile being free from the controversial constituents such as heavy metals or phosphates, whose use is becoming increasingly restricted. Additionally, Accepta Bromgard 2305 offers the same superior protection over an extended range of pH, temperature and raw water hardness, making an ideal treatment for both building services and industrial applications. To ensure rapid film formation and corrosion control the system should be pre-treated with Accepta Bromgard 2305 for two or three weeks at twice the normal continuous dosage. The exact dosage required will depend on a number of factors but will normally be in the range of 100-200ml/m3 in recirculation.